Summer’s here and there’s so much to do at Seattle Center! I recommend watching a movie under the stars at Seattle Center’s Mural Amphitheater. Bring a blanket and claim your spot on the grass in front of a giant movie screen. Attending Movies at the Mural is FREE – the movies begin at 9pm! Seattle Center Monorail is open weekends from 8:30 AM to 11:00 PM and on weekdays from 7:30 AM to 11:00 PM. 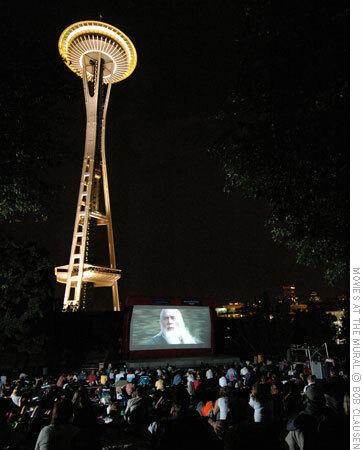 Come enjoy an awesome movie with a spectacular view of the Space Needle in the distance! You can RSVP to the event on the Facebook event page or just show up for the movie of your choice. Enjoy! This entry was posted on July 27, 2011 by Megan Ching. It was filed under Information, Upcoming Events and was tagged with Date night, Entertainment, film, Free, Inception, Monorail, movies at the mural, Mural Ampitheater, Mural Ampitheatre, Night, O Brother, Outdoor movie, Raiders of the Lost Ark, Seattle, Seattle Center, Space Needle, summer, The Incredibles, The Princess Bride, What to Do, Where Art Thou?.